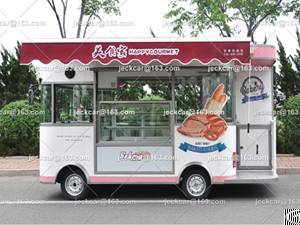 2.Packaging Details:Fix in the container on the four corners by the chains and hooks for food truck or according to customer requirements. 3.Company information: Shangdong Jiejing New Energy Technology Co., Ltd.is a domestic enterprise which designs and manufactures the electric cars.We own the brand-JieJing.There are different kinds of products under this brand, like the food truck, mobile advertising car, mobile snack car and others.Relying on the strong ability of research, developmet and design of the product, the company develops the mobile stores which is characteristic and valuable in advertisement and makes it to be the highlight of the street.Therefore, the client will get profit quickly.It is our belief to seek development by service and put the client�s benefit in the first place. Company Name: Shangdong Jiejing New Energy Technology Co., Ltd.